Notes: "Campbell Buchdrucker Presse, Typographique de M.Campbell." This may be considered as an annex to Machinery Hall, and is situate due west of that building, near Elm Avenue. 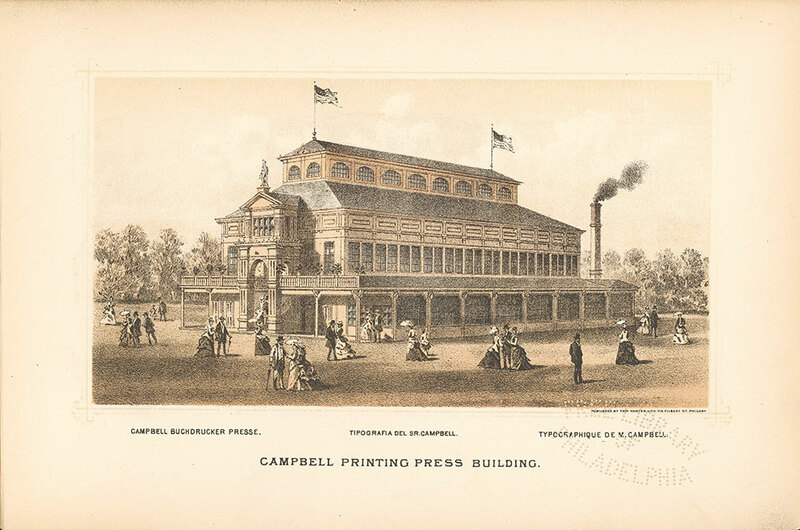 The Campbell Printing-press and Manufacturing Company of New York has erected this structure in order to demonstrate the facilities which it possesses for the illustration of the processes by which to aid the art preservative of all arts. The building is 124 feet in length by 88 feet in width, and is equipped to contain a complete newspaper office, with editorial, composing and press-rooms, and job office. Here are exposed in the plainest manner all the mysteries which once surprised an unexpecting world, and caused the suspicion, when Gutenberg and Faust made their discovery known, that by the assistance only of the father of evil could such things be done. Here may be seen reporters and editors scratching off articles for the press at the rate of twenty pages an hour. The busy printer’s “devil” reveals himself and issues his importunate commands for “copy.” The compositor, with stick and rule, hovers over his case like a humming-bird over a flower, and drones out, as he adjusts his type, the unending refrain of “Click, clickety, click.” The proof-reader hurries over his business with seeming rapidity, but with great sharpness to detect errors and executive ability to correct them as he goes along. Then comes the work of correcting, of adjusting the matter in form, of stereotyping, perhaps, and the final arrangement of the type upon the press, from which the printed sheets soon issue with amazing rapidity. Among the presses in use are Campbell’s printing, rotary and folding machine, with a capacity of 20,000 copies folded per hour, and 25,000 unfolded. There are besides a large number of cylinder presses and job-presses and other machinery, including the antique press of Isaiah Thomas, the father of printing in New England, with the furniture of his office and various other tools and implements connected with the history of typography in this country. Notes: Architect: Alexander B. Bary. Notes: The Building, situated in a grassy field, with trees in background. People stroll in the foreground.